Juggling is an entertaining art form. It conveys an impression of incredible skill and practice. However, it is not as difficult as it looks, and any one can learn to juggle with the correct approach. It is like learning to ride a bicycle, - more a matter of getting the feel or knack, rather than any extra ordinary skill. 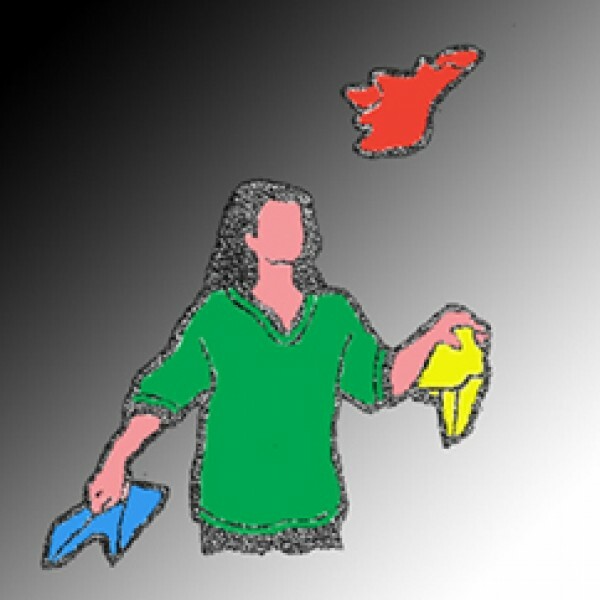 Once you have acquired the knack, practice will enable you to juggle with more or different objects. In this outfit we supply a set of three special scarves (approximately 21" square) in vibrant Fluorescent colors, with instructions, to teach you to juggle as well a a few magic tricks you can perform with the scarves. These scarves are made from a light weight gauze fabric, and they flutter down, making the "juggling easy to learn, and impressive to watch. Carry in your pocket, and be ready to impress any place, anytime, with a modest amount of practice ! JUGGLING RING - Ultra Pro. Brand new Four ring art, stunning visual effects, expected to be popular..
JUGGLING RING - Ultra Brand new Four ring art, stunning visual effects, expected to be popular all ..